BOULDER, Colorado, June 3, 2010 (ENS) – Oil from the massive spill in the Gulf of Mexico is likely to extend along thousands of miles of the Atlantic coast and into the open ocean as early as this summer, according to a detailed computer modeling study released today by the National Center for Atmospheric Research. The computer simulations indicate that, once the oil in the uppermost ocean has become entrained in the Gulf of Mexico’s fast-moving Loop Current, it is likely to reach Florida’s Atlantic coast within weeks. It can then move north as far as about Cape Hatteras, North Carolina, with the Gulf Stream, before turning east to the open ocean. Whether the oil will be a thin film on the surface or mostly subsurface due to mixing in the upper ocean is not known. The flow in the model represents the best estimate of how ocean currents are likely to respond under typical wind conditions. 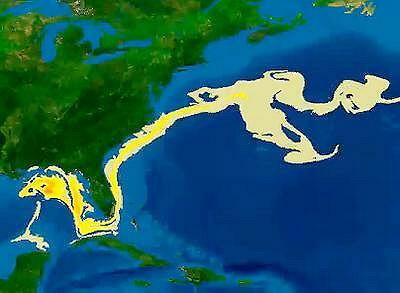 More model studies are underway that will indicate what might happen to the oil in the Atlantic Ocean. “We have been asked if and when remnants of the spill could reach the European coastlines,” says Martin Visbeck, a member of the research team from the Leibniz Institute of Marine Sciences at the University of Kiel, Germany. To model the flow of oil, NCAR scientists are using the Parallel Ocean Program, the ocean component of the Community Climate System Model, a powerful software tool developed by scientists at NCAR in collaboration with the Department of Energy. They are conducting the simulations at supercomputers based at the New Mexico Computer Applications Center and Oak Ridge National Laboratory. The NCAR scientists simulated how a liquid released at the spill site would disperse and circulate, producing results that are not dependent on the total amount released. The scientists tracked the rate of dispersal in the top 65 feet of the water and at four additional depths, with the lowest just above the sea bed. “The modeling study is analogous to taking a dye and releasing it into water, then watching its pathway,” Peacock says. The dye tracer used in the model has no actual physical resemblance to true oil. Unlike oil, the dye has the same density as the surrounding water, does not coagulate or form slicks, and is not subject to chemical breakdown by bacteria or other forces. Peacock and her colleagues stress that the simulations are not a forecast because it is impossible to accurately predict the precise location of the oil weeks or months from now. Instead, the simulations provide possible scenarios for the oil dispersal. The timing and course of the oil slick will be affected by regional weather conditions and the ever-changing state of the Gulf’s Loop Current, neither of which can be predicted more than a few days in advance. The dilution of the oil relative to the source also will be impacted by bacterial degradation and other conditions, which are not included in the simulations. What is possible, is to estimate a range of possible trajectories, based on the best understanding of how ocean currents transport material. The oil trajectory that actually occurs will depend on both on the short-term evolution of the Loop Current, which feeds into the Gulf Stream, and on the state of the overlying atmosphere. Oil has been spilling into the Gulf of Mexico since April 20 when the oil rig Deepwater Horizon exploded and caught fire. Oil giant BP, which leased the rig to drill a test well 18,000 feet below the seafloor has not been able to stem the flow of oil from the broken wellhead. Now, 45 days after the spill began, an estimated 540,000 to 1.25 million barrels of oil have entered the waters of the Gulf of Mexico, according to statements by the National Incident Command’s Flow Rate Technical Group and an addition estimate given by Incident Commandert U.S. Coast Guard Admiral Thad Allen in a news briefing this week. 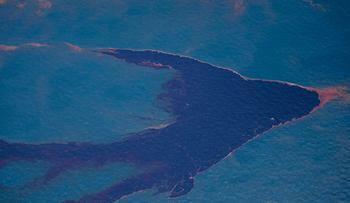 Some of this oil has evaporated or been collected by skimmer boats or burned on the surface of the water. The spill is located in a relatively stagnant area of the Gulf, and the oil so far has remained relatively confined near the Louisiana and Alabama coastlines, although there have been reports of small amounts in the Loop Current. 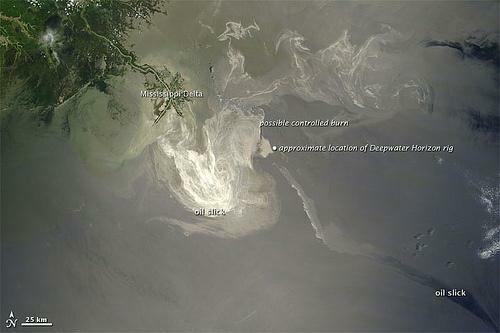 Oil has come ashore in Louisiana, Alabama and Mississippi. The six model simulations released today all have different Loop Current characteristics, and all provide slightly different scenarios of how the oil might be dispersed. The simulations all bring the oil to south Florida and then up the East Coast. However, the timing of the oil’s movement differs depending on the configuration of the Loop Current.